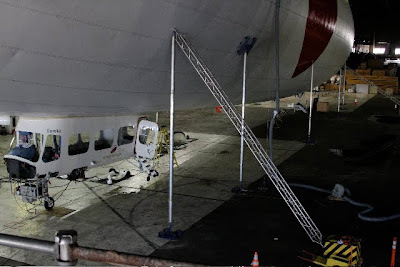 As Matthew carries out the annual maintenance procedures, Eureka is drained of helium, and the ship is now supported from the nose by the mast truck, and at six of its frames by posts and beams. You can see the gray helium drain hose coming from the top off the ship to the bags and blower. 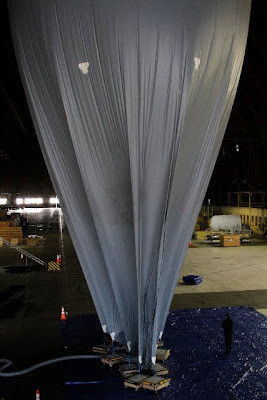 As the helium is drained, it's pumped into three giant helium storage bags. 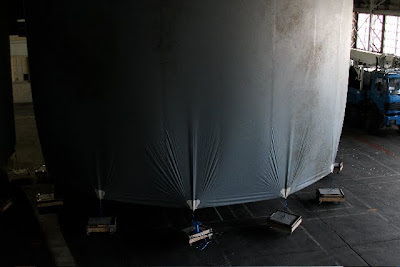 Each bag holds 2,300 cubic meters of helium and, alone, each could fill a MetLife blimp with 8,600 cubic feet of surplus helium! Eureka holds a total of 7,400 cubic meters of helium, so where does the other 500 cubic meters go? Because the bottom-most helium mixes with air as the envelope slowly drains out the top, the 'dregs' are not worth putting back in and must be vented. The bags are held down by concrete blocks on castor wheels - each one is 400 lbs! Up next: Why take out all the helium?